Welcome back to a new term of #ECGclass! Hope you've all had a restful summer break, and a big welcome to all all newcomers. It's Monday morning surgery and your 4th patient arrives at your door. She's a 30yrs old lady who is not well known to you, but at first glance she's visibly unwell. She's breathless at rest. Before she came into the room, you'd scanned her medical notes. No significant past history. No asthma. Her only attendances have been to see the practice nurse for the contraceptive pill. Her BP has always been fine and she's had no children. She's a slim, non-smoker. She tells you that she been very breathless on trivial exertion over the past couple of weeks but this has been steadily getting worse. Over the last 24hrs, she has become breathless at rest. She's also feeling dizzy and faint. Overnight she's been troubled by a tight pressure discomfort in her chest and has had to sit up all night to get comfortable. She's been feeling generally more tired than usual for the past few weeks, such that she had been thinking about coming to see you, but little else to report. She denies any cough or prodromal illness. On examination she's quite tachypnoeic with a peripheral Oxygen saturation of 97%. Her lung fields sound clear, but quiet. She's has a tachycardia and her pulse feels weak. Her heart sounds are muffled. Her BP is on the low side, at 90/56, but her systolic is usually only around 100mmHG. You are quite concerned, and want her admitting for an urgent CXR. Q1. What is the rate? Q3. Are the QRS complexes seen? Are they of normal, narrow morphology? Are they uniform and consistent? Q4. Are there any ST changes associated with her tight, nocturnal chest pressure discomfort? Q5. Does the ECG help you predict what the CXR will show? The ECG shows a regular sinus tachycardia with a rate of just over 100 bpm. The P waves are present with normal consistent morphology and a normal PR interval. There are no diagnostic ST segment changes. But take a close look at the QRS complexes. Yes they are of normal, narrow morphology, and follow each P wave, but note how within a single lead view they change in amplitude? (Seen perhaps most clearly in Leads II, III and V5). This shouldn't happen. How could it? What determines the amplitude of the QRS? Well, two things we know play a role in QRS amplitude are ventricular muscle mass (LVH) and thoracic impedance (body habitus) - neither should change beat-to-beat. The ECG above shows Electrical Alternans. 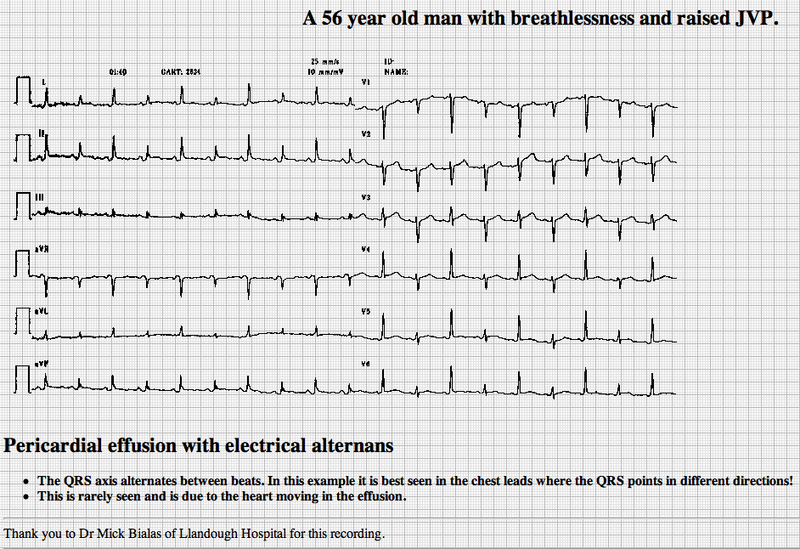 Basically, in electrical alternans, the QRS amplitude - or even axis - alternates between beats. This is seen in cardiac tamponade and severe pericardial effusion. This results from changes in the ventricular electrical axis as the heart just 'swings' and wobbles about in a fluid filled sac. The 30yr in the case above, has basically presented to you in heart failure. She would have likely had a raised JVP and pulsus paradoxus if you'd checked, too. You might have heard a pericardial friction rub (scratching noise, heard best on expiration with the patient sitting upright a forward). On arrival at hospital her CXR is likely to show a large globular cardiac shadow. Thoracic malignancy, or potentially treatable infectious causes, of pericardial effusion need to be searched for as a matter of urgency in this lady. The commonest cause of malignant pericardial effusions is metastatic lung cancer in men, and breast cancer in women. Other causes of malignant pericardial effusions include haematological malignancies such as Leukaemia, Hodgkins, and non-Hodgins lymphoma. Infectious causes include HIV, TB, Cocksackie A and B and Hepatitis, amongst a whole host of other bacteria and parasites. In the setting of the GP surgery, the ECG wouldn't necessarily have been the first test that would spring to mind here. The diagnosis would have been made by CXR and subsequent ECHO. Had the presentation been less acute, and admission not required, the ECG may have helped clinch things. Well done all - and thanks for all your input. 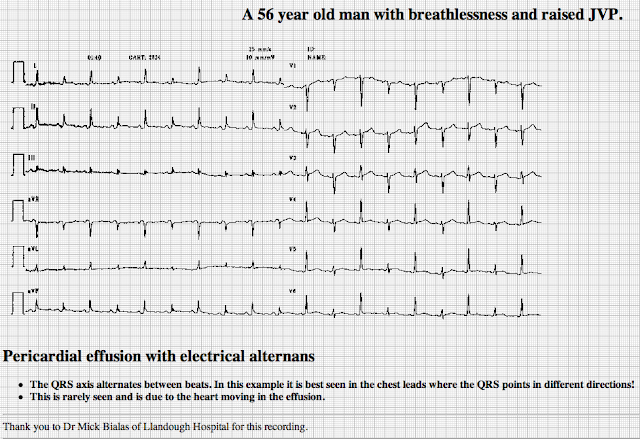 Welcome back everyone to another term of interactive ECG learning. I hope you've all enjoyed the unusually long hot summer and feel suitable relaxed and refreshed as we head into Autumn. Over the the last few months, I'm delighted to welcome many new-comers to the @ECGclass Twitter feed and hope you find it helpful and relevant. For the benefit of those who are new, below is brief outline of how the two component sites weave in together. #ECG Class is an educational blog which runs alongside Twitter @ECGclass.